G-Lock Email Processor offers great features for automatic attachment processing. With G-Lock Email Processor you can automatically extract attachments from incoming messages and save them to the hard disc. Plus, G-Lock Email Processor can rename the attachment based on your settings and save it to a folder under a new name. This program recognizes email attachments in most standard business formats, including PDF, TIFF, Word and Excel documents. 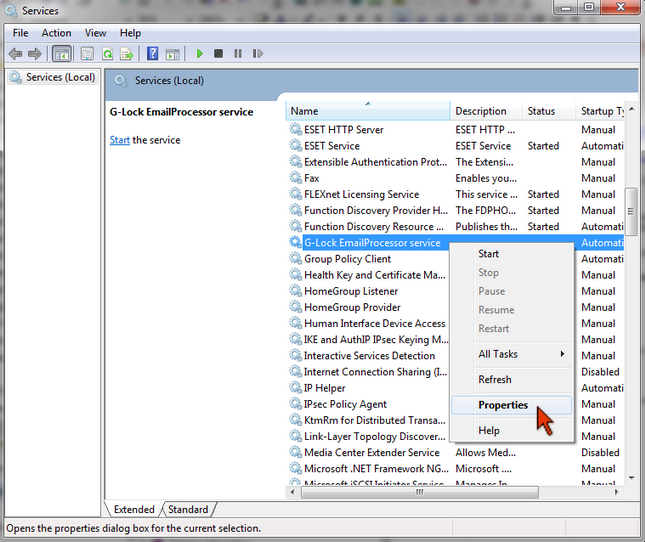 To extract email attachment(s), add the "Block Extractor" component to the rule in G-Lock Email Processor. Type a block name, for example, Extract_attachment. Select "Attachment file name(s)" in the Source menu. Leave "Start Position" and "End Position" fields as is. You can save a sample message with attachments to the disk and select it in the Rule Settings (double click the mouse on the rule name in the list of rules). In the Block Extractor click Test to see if the attachments are found or not. To save extracted attachments to the disk, add the "Save Attachment" component to the rule. Type a component name, for example, Save_attachment. Select a folder on the local disk to save attachments' files. If you want to rename the files, you can type a mask to generate new file names. For example, the mask 2011-09-07-[%Extract_attachment%] adds the date before the original attachment name. If you want to save attachments to a folder on the network drive, follow the steps below before you start G-Lock Email Processor service. To do this, stop G-Lock Email Processor service by clicking on the "Stop Service" button. Click the right mouse button and select "Properties". 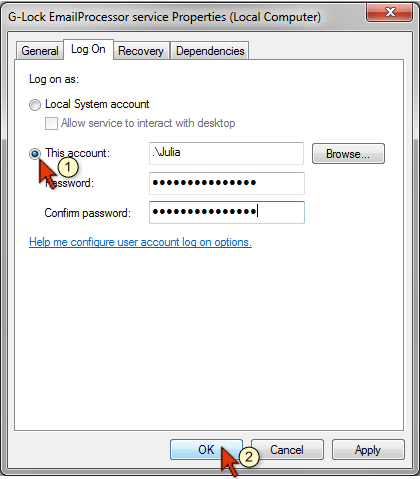 On the Log On tab un-select "Local System Account" and select "This Account". I was running G-Lock Email Processor on my computer under my local account. I decided to connect to the Unsubscribe.mdb file on the network drive and update it. I created an account on DISKSTATION. I mapped to the DISKSTATION\public on the network drive from my computer. I created a link from G-Lock Email Processor to the Unsubscribe.mdb file on the mapped Y drive. "Y:\Unsubscribe.mdb" is not a valid path. Make sure that the path name is spelled correctly and that you are connected to the server on which the file resides. So, I specified the full path to the Unsubscribe.mdb file as \\DISKSTATION\public Unsubscribe.mdb in G-Lock Email Processor and tested the rule. "The Microsoft Jet database engine cannot open the file \\DISKSTATION\public Unsubscribe.mdb. It is already opened exclusively by another user, or you need permission to view its data"
I supposed that this error might be caused by a mismatch in the passwords I used to login to my system and create an account on DISKSTATION. When creating an account on DISKSTATION I used a different password than the one I use to login to my system. The user name was the same. So, I changed the password for my DISKSTATION account to match my system password and it worked well. Now I could successfully connect to the Unsubscribe.mdb file on the mapped Y drive. G-Lock Email Processor is a flexible data parser and extractor for processing incoming emails and attachments. Try it for free and parse your first emails within minutes!